A group of eight Minnesota municipalities recently filed federal lawsuits against seven chemical refiners. The municipalities seek to offset the costs of limiting environmental damages from polycyclic aromatic hydrocarbons (PAHs). The plaintiffs allege that the refiners knowingly sold coal tar-based pavement sealants high in PAHs despite widespread evidence that the substances can cause cancer in humans and harm to fish when unsettled by car tires and swept into waterways by wind or rain. 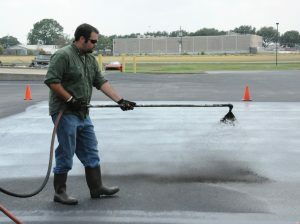 Pavement sealants made from refined coal tar contain high concentrations of polycyclic aromatic hydrocarbons (PAHs), chemicals known by scientists to carry health risks for humans and fish. Eight Minnesota cities recently filed separate lawsuits against several large companies that manufacture and sell coal-tar sealant, aiming to offset significant cleanup costs that municipalities and taxpayers currently face. U.S. Geological Survey. The sealants, made from refined coal tar, were once commonly painted over parking lots, driveways, and other hardscapes to enhance aging pavement’s ability to weather the elements. Although Minnesota became the second U.S. state to ban the sale and use of coal tar-based pavement sealants in 2014, many municipalities in the state still are discovering high PAH concentrations in soil and stormwater ponds. Purging PAHs from stormwater ponds is not simple or cheap. As existing sealants continue to degrade over time, PAHs can end up in sediment entering the more than 15,000 stormwater ponds in the Minneapolis–St. Paul metro area. When enough of that contaminated sediment enters ponds, federal regulations require municipalities to dig up and transport the sediment to landfills as opposed to traditional mitigation measures. That difference could double or triple total cleanup costs, reports the Tribune. In Burnsville, a suburb just south of Minneapolis, public works director Ryan Peterson told Minnesota Public Radio that as many as one-third of the city’s 270 stormwater retention ponds are contaminated with enough PAH to require transport to landfills. Aiding the plaintiff’s case is a 2010 study conducted by the Minnesota Pollution Control Agency. The study found that about 67% of total PAH-contaminated sediment in metro-area stormwater ponds originated directly from the coal tar-based sealants. According to the Twin Cities Pioneer Press, state pollution officials estimate that total PAH cleanup costs for sediment-heavy ponds in the Minneapolis–St. Paul metro area could exceed $1 billion, a burden likely to fall partially on taxpayers if the lawsuits are unsuccessful. 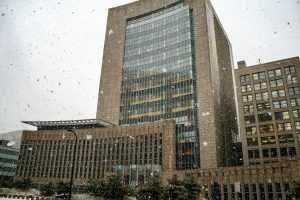 Seven cities – Burnsville, Eden Prairie, Golden Valley, Maple Grove, Minnetonka, and White Bear Lake – filed suits in Dec. 2018. An eighth municipality, Eagan, filed suit in mid-January. The excessive cleanup costs faced by the plaintiffs have a ripple effect on water quality. Much of the funds budgeted to ensure retention ponds are maintained to keep pollutants out of larger and more vulnerable waterways must now go toward sediment monitoring, testing, and disposal, Peterson said. Burnsville, Eden Prairie, Golden Valley, Maple Grove, Minnetonka, White Bear Lake, and Eagen in Minnesota filed federal lawsuits against refiners in the U.S. District Court in Minneapolis. Plaintiffs hope to recoup some of the funds they must spend on sediment monitoring, testing, and disposal as a direct result of PAHs from coal tar-based sealants. Tony Webster/Wikimedia Commons. Statewide bans on coal tar-based sealants are currently in effect only in Minnesota and Washington. However, a growing number of municipalities, university campuses, and retailers also have imposed bans, including Washington, D.C., the University of Illinois (Springfield), and Home Depot (Atlanta). Thanks for covering this important lawsuit. Thank you, Tom! We’ve just updated that link to also include bans since 2016.